The CRA and Alta Planning + Design, have finalized design documents for a streetscape redesign of Galileo Galilei Way, Binney Street (from 3rd to Fulkerson), and Broadway (from Ames to Galileo). 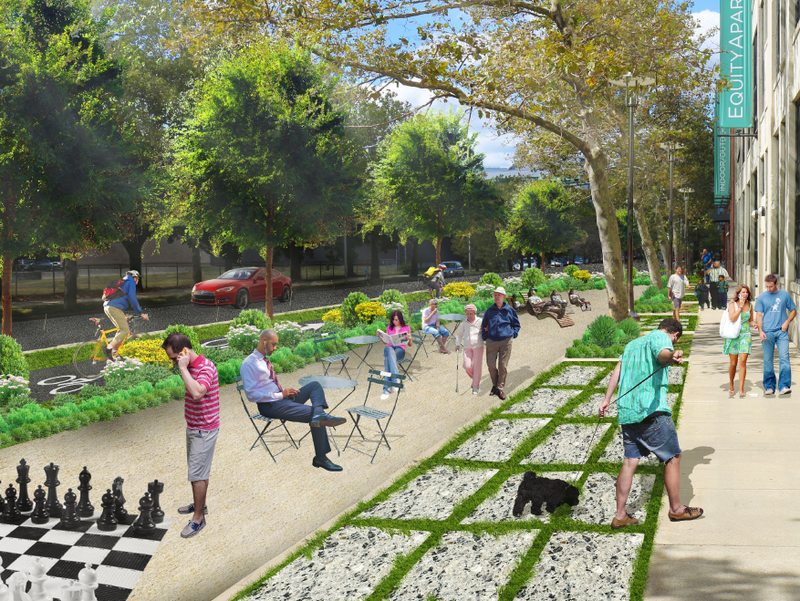 The project connects existing bicycle and sidewalk infrastructure on Vassar and Binney and holistically incorporates a multi-modal streetscape design with streetscape amenities and landscaping. The new street plans create a unified look and feel for the area, uses progressive complete street and Vision Zero design principles, and national best practices. Design documents can be found using the link below. The project has been a collaboration between the CRA, the City of Cambridge Department of Public Works (DPW), Cambridge Traffic Parking & Transportation (TPT), and the Cambridge Community Development Department (CDD). Creates a protected bicycle link from the Vassar/Main intersection to the Binney/3rd intersection with separated bicycle lanes and protected intersections, consistent with the Cambridge Bicycle Network Plan. Establishes minimum sidewalk widths to ensure comfortable pedestrian use. Facilitates bus travel for the MBTA and EZRide Shuttle and enhances bus waiting areas. Example of a Protected Intersection. Click here to learn more. Reflects the City’s commitment to Universal Design and accommodations for persons with disabilities. Improves pedestrian and bicycle accommodations and safety at all crossings. Implements a protected intersection at the crossing between Broadway and Galileo Galilei way. A protected intersection brings bicyclists to road-level grade at intersections to facilitates bicycle turns in all directions, and provides desirable separation between bicycles and pedestrians, minimizing conflicts between these modes. Achieves environmental goals and stormwater retention through innovative green/blue infrastructure (G/BI), which are systems designed to slow, absorb, and filter stormwater at or near its source. Preserves existing street trees, and recommends tolerant street tree varieties to plant. Improves lighting for pedestrians, cyclists and motorists particularly at intersections. Recommends street furnishings to create a socially and economically vibrant streetscape and unified aesthetic including: benches, bike racks, trash and recycling receptacles, landscaped planters and movable furniture. As new development proposals are permitted, this project's pre-approved 25% design drawings will be implemented by the applicant for their applicable portions of the streetscape in their development proposal. This will create a more streamlined development process for the City and developer, and a more consistent public realm. 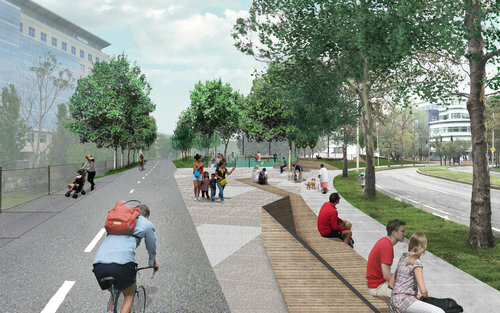 The streetscape project also links the streetscape, bike and pedestrian facilities in Grand Junction Park and Loughrey Walkway (6th Street Walkway). CRA staff also worked closely with CDD to ensure an integrated streetscape design with the future Binney Street Park - see CDD's website. The CRA organized direct coordination with property owners, transportation providers and stakeholders to ensure the project resulted in realistic and actionable plans. Numerous public meetings were held by the CRA with local community groups, business associations, and city agencies and committees to solicit project suggestions and ideas. Feedback has been incorporated into the project during the design process. For a complete list of publicly held meetings see here.